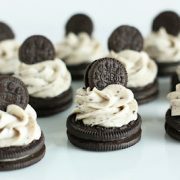 Crisp chocolatey mini Oreo cookies topped with rich and simple cheesecake topping. In a mixing bowl, using an electric hand mixer, whip together cream cheese, powdered sugar and vanilla until smooth. Using a wire whisk, stir in cream, milk and instant pudding. Whisk mixture for about 2 - 3 minutes until very thick. Freeze mixture for 5 minutes. Meanwhile, place 3 large Oreos in a ziploc bag, seal bag and crush Oreos finely using a rolling pin (alternately you can do this in a food processor). Stir crushed Oreos into cheesecake mixture. Pipe cheesecake mixture over 30 large Oreos, then top each one with a mini Oreo. For best result serve immediately (store in refrigerator if not used immediately).